These three ordinary yet remarkable South Africans open a window into a universal struggle to achieve peace. They dared to fight inequality and apartheid in their South African townships. 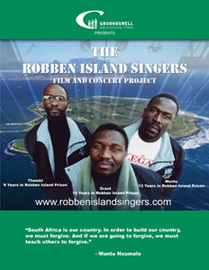 For that, they were branded terrorists and were imprisoned with Nelson Mandela in the notorious Robben Island Prison. But while they were incarcerated in that brutal environment, they somehow learned to forgive their captors, and uplift one another through song. With the wall of Apartheid gone and a new South Africa born, these three ex-political prisoners are spreading their message, including to some of Chicago’s toughest schools, where their lessons are sorely needed.